For the past year, I have had two principal jobs – running the Center for Court Innovation and helping to coordinate the Independent Commission on New York City Criminal Justice and Incarceration Reform. A few days ago, the second job came to a happy conclusion with the release of the Commission’s final report. 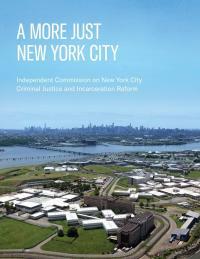 The report is more than one hundred pages long, but I can summarize the principal conclusion: the jail complex on Rikers Island must be closed. In truth, the Commission is not the first organization to make this case. Indeed, Glenn Martin, gabriel sayegh and the #CLOSERikers campaign have been making this argument for some time. What made the Independent Commission unique is that it set out to demonstrate how this goal might be accomplished. The resulting blueprint details how the jail population in New York City might be reduced to roughly 5,000 people through improved diversion, pretrial justice, case processing, and sentencing. It is going to take some time for policymakers to digest the Commission’s report and weigh all of the recommendations. The good news is that they will be doing so in the context of Mayor de Blasio’s historic decision to endorse the goal of closing Rikers Island. In making this announcement, the Mayor underlined the difficulty of the task ahead. I don’t think anyone who has studied Rikers would disagree. We have miles (and years) to go. But at least we are on the path. And that is worth celebrating. I said before that the thing that made the Commission unique was its mission to come up with what the New York Times called “a specific, sensible, defensible plan.” But there were a few other things that made the Commission unique. First was its leadership. The Commission was fortunate to have former New York State Chief Judge Jonathan Lippman as its chair. Judge Lippman’s work ethic, strategic wisdom, and good humor kept the group constantly moving forward. New York City is lucky indeed that City Council Speaker Melissa Mark-Viverito selected Judge Lippman for this assignment. Second, the Commission brought 27 leaders from a variety of fields to the table. They included people with experience in law enforcement and people with experience behind bars…business leaders and community activists…defense attorneys and prosecutors…you name it. Remarkably, everyone was willing to put their egos aside, roll up their sleeves, and devote hundreds of hours to the challenge of Rikers Island. Third, the Commission relied on the expertise of several private and non-profit partners. In addition to the Center for Court Innovation, these included CUNY Institute for State and Local Governance, Latham & Watkins LLP, Vera Institute of Justice, Forest City Ratner, HR&A Advisors, and Global Strategy Group. I know for a fact that all of these groups devoted considerable pro bono time to staffing the Commission. Finally, I would be remiss if I didn’t acknowledge that dozens of people at the Center for Court Innovation contributed their time and ideas to this project – analyzing data, suggesting language, brainstorming solutions to obstacles along the way, etc. There are too many to name them all, but I have to cite three: Nora McDonnell, Mike Rempel, and Courtney Bryan. Nora served as our organizational backbone. Mike was the man with the vision and the command of the data and the seemingly endless capacity for hard work. And Courtney…well, Courtney was everything. She was, like Reggie Jackson, the straw that stirred the drink. Many, many people deserve credit for the Lippman Commission – it was a complicated undertaking that required the active collaboration of literally dozens of people (and no small dose of good luck). But I can tell you without fear of contradiction that Courtney Bryan was absolutely essential. A unanimous, “thoroughly researched and compelling presented” report simply doesn’t get done without her smarts, her hustle, and her charm. Period. Apologies for the long, congratulatory message, but certain things must be said.